I am a landscape painter because I love being outdoors. As a young child, I often played in the sunflower fields and grassy meadows around our family home in Casper, Wyoming, and I believe that this rural background has helped me develop a unique appreciation for nature. I love painting the subtle hues and patterns that appear in the mountains and the unique character of each tree. I particularly enjoy attempting to capture the delicate nuances of movement and color in water. My goal as a painter is to share a special moment of the peace, joy and freedom with my viewers and record the beauty that surrounds us. Each painting is a unique journey and can be likened to a hunt. Armed with my paints, I search for that perfect combination of sky and earth by fording streams and climbing fences. As I track down my beauty, I strive to develop a spiritual connection with the land and listen with my heart as I search for a pleasing composition with my eye. 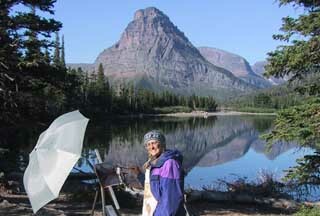 Once I have “bagged my elk” or found a good spot, I set up my easel and take aim with my brushes to paint a field study. The day is not a success until I have captured the unique light and colors which make up the essence of the location, and then I take lots of reference photos. While the painting is born on location, I usually complete it in my studio. With reference material at hand, I set about the hard work of trying to express real yet intangible things on canvas. The job is to try to visualize and bring to life what it was that made that location a prize elk for me. While striving to execute the painting to the best of my technical abilities, I also hope to allow some of the ethereal qualities of the scene to emerge.